Argyle Feed Store has gates, panels, feeders, stock tanks, chutes and livestock handling equipment for all your farm and ranch needs in North Texas area. 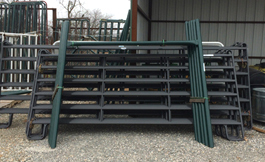 Our store stocks many livestock panels and gates on hand. When traveling through south Texas make sure you stop by one of our stores for all your livestock handling equipment needs. You can find Ranger Gates and Hutchison Western livestock equipment and arena systems. Give us a call for more information. Mon – Sat: 8:00 a.m. – 6:00 p.m.
Sun: 10:00 a.m. – 5:00 p.m. Subscribe to our low volume e-newsletter to keep current on events and have access to special subscriber only discounts!